We are planning on upgrading the current forum from phpBB to Invision Power Board within the next week. This will bring more functionality to the user end as well as the moderation/administration piece. When the change takes place you will retain your current login and password. All current forum content will also be transferred over to the new setup. An email will be sent out prior to the transition and another once the transition is done. We are planning on doing the switch over tonight, Nov 29. It will be late, around 10pm EST. It should be back up and accessible within an hour. We are currently using the default skin for IPB. We will make more available in the future. I liked the old software better. It does not allocate enough PM storage. My mailbox was instantly full. I know I need to cull the messages periodically, but this will require doing it much more frequently. There is no link to the main index on the bottom anymore. I have to scroll to the top to find it. It changed my choice to show my e-mail address and made it hidden. I'd rather people be able to click a button and e-mail me like before, qne I didn't like it changing that. The Help system is inadequate. What does "Guided Mode Off" mean? Hitting reply to a PM automatically quotes. I don't want to quote unless I deliberately choose to quote. I know I can delete the quote before typing, but why should this be necessary? I know - complain, complain. This new software seems to be a bit more sophisticated, but I don't see the need for such sophistication. The other one was simpler, worked better (IMHO), and looked nicer. I don't need more smilies. Alright, I admit, I do like the list of all new messages, but I'd trade it to get highlighted links back. Ed, you will get used to it. Alot of us who have frequented other boards have already become accustomed to it. The important thing is that without Drew, this board would not be. He spends countless hours creating, managing, and updating this board for us. He does this because he wants this forum to be successful. His only compensation is the friends he meets, and the satifaction of knowing that with a little help from his friends that he has built the first successful native fish forum. Go to www. 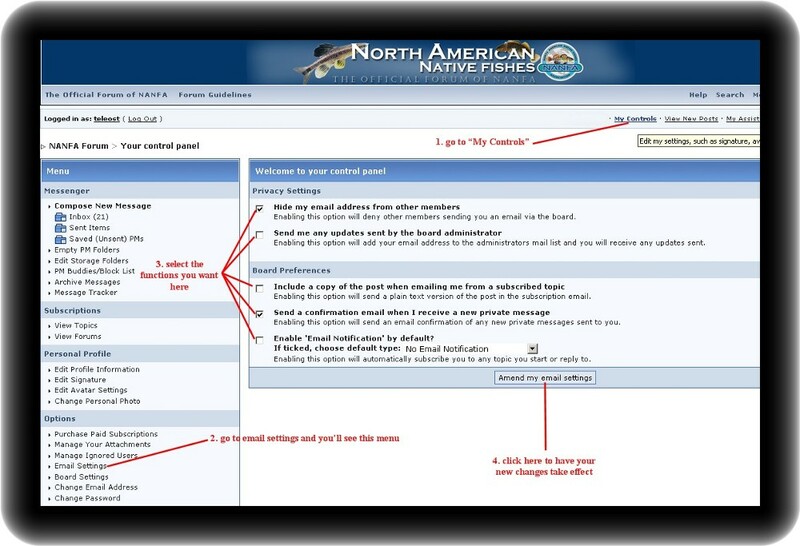 nativefish.org. check out their forum. I believe it has been in existence longer than ours. This software will make his job easier. We just need to get used to it. Also there are some glitches that Drew is still working on. Today we had a big influx of spammers, tomorrow we won't. Your PM storage space has already been increased. This is only the second day. I appreciate what you are saying, Matt, and I was not trying to criticize Drew. Often my attempts to provide constructive criticism are mistaken for being mean, or unappreciative, so I apologize to Drew if he takes it that way. I appreciate the time he spends, and he deserves cudos from all! If he's looking for feedback on the new software, and I assume he is (although in all honesty he did not ask for it), I vote to restore the old, or make some adjustments to the new if possible. Sorry Ed, but I think you read ME wrong. What I am saying is that IMO whatever makes Drew's job easier is good for me. I know that you were not being mean, I was just trying to shed some light on the importance of this software as opposed to the old. That was a function of the skin we were using that a third-party developed. I can probably mimic this functionality on this forum. As said in another post, we will make more skins available. I increased this number to 100. This should be sufficient for most. Let me know if you continue to have problems. Unfortunately this is the design of the current system. I actually prefer it this way so email addresses aren't displayed on the forum. That is an easy way for spammers (which we try to keep away) can collect addresses. Scroll to the bottom and click "Add Reply", you won't quote anything. It is more sophisticated and we have our reasons for changing. Unfortunately you can't please everyone all the time, so there will be some things that some people won't like. We will try to accommodate everyone but it will be nearly impossible to do so. I would like to start by letting you know that I didn't understand you to be mean or overly critical edbihary. I don't think others took it that way either. I want to hear your thought as well as others. Without your opinion we'll not move forward. This function still exists just a little different. Where you see a subforum, you can still link directly to it. 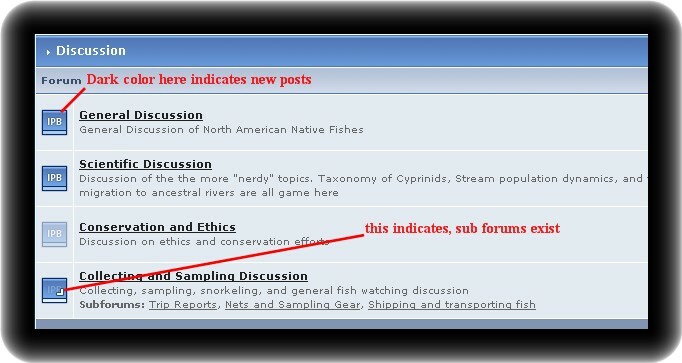 Once you open a forum you'll see the little orange box. This indicates new posts. Personally I like them located here since I can quickly scan the forum for new posts (always in the same location). Please remember anyone can see the forum (including spammers). This way you have the option to shield yourself from them with a hidden email. When I want to contact a forum member I usually start with a "PM". If we decide to take the discussion to email I simply ask for it in private. I personally like this option. This always keeps the topic of discussion at hand. Otherwise you must have two windows open or copy and paste when a reply is relevant to the previous statement. If you feel you must delete the previous text in the PM perhaps a new PM would be more appropriate. This will give the recipient a new title and conversation to look for when attempting to find the information at a later date. This is a good time to advise all members to explore the new options available in "My Controls". Please take look and feel free to make changes to your account. 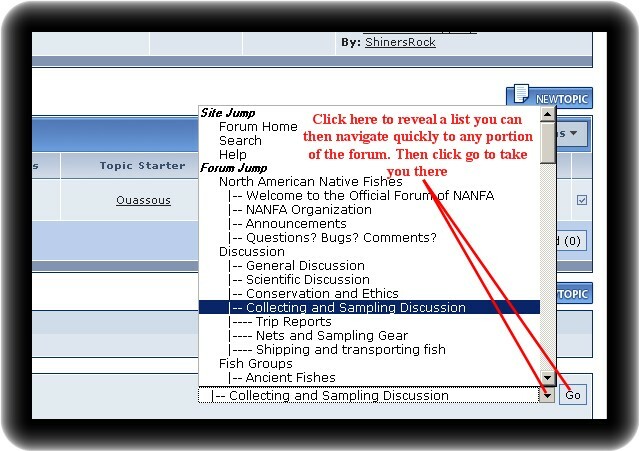 The new forum design has many new option (too many to discuss right now). Please take the time to explore them and comment on how we can work together to improve navigation etc. In time the forum will take shape. Many minor changes to the graphics are likely to occur in the future making navigation and viewing a best for all. I actually prefer it this way so email addresses aren't displayed on the forum. That is an easy way for spammers (which we try to keep away) can collect addresses. Actually, I thought (assumed) that is why the old system had e-mail addresses linked to a button, rather than displaying them. Can spammers harvest e-mail addresses from a button? BTW, I don't know if you're aware of it, but the multi-quote feature does not seem to be working. Or is that some sort of user error on my part? Wow, teleost, while I was typing this up, you were preparing a nice mini-tutorial. Very nice. The issue I had with the e-mail display choice was not that I didn't know how to change it. It was that in the transition it overrode my previous choice and set it to the default. It should have respected my previous choice. It is presumably a minor bug in the software. I have set it to display e-mail, yet I still don't see a button on my posts like before. I don't see my e-mail displayed openly, either, although I really expected the button I don't understand that. Does anybody know what this option does? FWIW, I still have the old "scrolling" problem with text in posts that have wide photos (like Teleosts). But at least it seems confined to that individual post, instead of widening the entire thread. I'm not sure I understand. Let me know if you still have a problem and I'll see what I can do. I could tell you knew how to change it but I thought it was a nice opportunity to make others aware of the "My Controls" section of the forum. 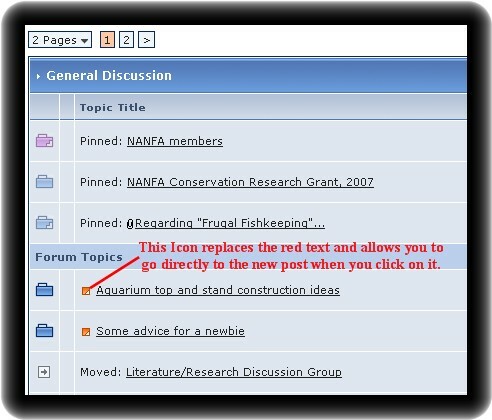 Indeed when we changed the forum software all members options have been reset to the new forum default settings. Since so many new options exist and it only takes minute or two to make the new changes, I thought a little visit to "My Controls" would be in order for all members in any case. Ahhh. My giant image was the cause of this. I've since made it small enough to not expand the post and still be legible. Any large image will cause the page to become wide. Nothing can be done about this other than user control. If you post large photos, that post will expand the viewing window to accommodate the large image. When I hit the "Reply button, I get a quote that includes your text, but not the quotes within your text. I assumed that the +Quote button, which the tooltip says in "Toggle multiquote addition", would toggle between this functionality and the old functionality where all quotes within a quote were also quoted. It does not seem to work. There is no help that I can find on this button. What exactly is the +Quote button supposed to do? Thats is because Quote Embedding is shut off. This saves alot of space in a thread. When I toggle it, it seems to have no effect. This is bacause the function is turned off in the board settings at this time.......We are still using the default IPB skin so the button is there, but it does not mean it's functional. Bear with us here... we only have so much staffing with so much time to address everything. I took us about a month and a half to put together the PhP board to a perfect functioning level. It's a pretty good chance that it will take a bit to iron out all the rough spots with this new build. Definitly keep telling us though what errors and problems are popping up so we can address them quickly. I see. You may want to consider enabling that button. I don't think embedded quotes have ever been the same sort of problem on the forum as they are on e-mail lists (especially digest versions). Not having the prior quotes embedded can sometimes cause a loss of context of a reply, making the reply difficult to understand, even if the reader scrolls through the prior messages. I personally have a beef with the software vendors on this issue, not the administrators. There is a trend in most software for documentation to become increasingly poor, if not entirely lacking. Paper manuals are pretty much a thing of the past, and help systems are becoming increasingly poor. The +Quote/-Quote setting is one of those cases. There is no documentation of this button in the help system whatsoever. The use of this button should have been explained by the software vendor, as well as the fact that it can be disabled by an administrator. Further, the software vendor should have made it such that, if the administrator does disable it, the button will be seen in the disabled (-Quote) state, and cannot be toggled by the user. I think that is a case of sloppy software writing. In my own experience as an amateur software writer (I have written VB and VBA applications for my own use and those with whom I work), I would never dream of having a functionless but apparently enabled button like that. I worked on a new skin this past weekend. You should be able to see it on the lower left drop-down. It is titled NANFA-khaki, but it is really gold. You can test drive and let me know if you see anything that I may have missed.